It is already October, and I thought I’d check my database to see if anything much has happened in significant previous Octobers that might be worth recalling. Checking for 150, 100 and 50 years ago, the following turned up. Taking 1863 first, we find quite a lot happened. For a start the Metropolitan Railway’s first carriages began to turn up. You will all know from the Underground 150 celebrations that the Metropolitan Railway opened to the public in January 1863, on 10 January to be precise, despite some unhelpful suggestions it was the 9 January. Far less well known is that the Metropolitan had no means of operating the line and had the option of either recruiting and training a full complement of staff from scratch, or getting an existing railway to ‘work’ the line. The alternatives were problematic. The first would ultimately be cheaper, but very painful and distracting in the first instance. The second (which was a very common approach) relied on getting the financial terms right if friction was to be avoided and the right level of service given. The second approach was agreed upon in 1862 and it was natural that the Great Western be asked to work the line as it had already contributed financially, was physically connected at Paddington and could use the broad gauge tracks that had been laid already at its insistence. A ‘worked’ line means that the working company takes responsibility for all operations including provision of staff, locomotives, rolling stock and day to day operations. 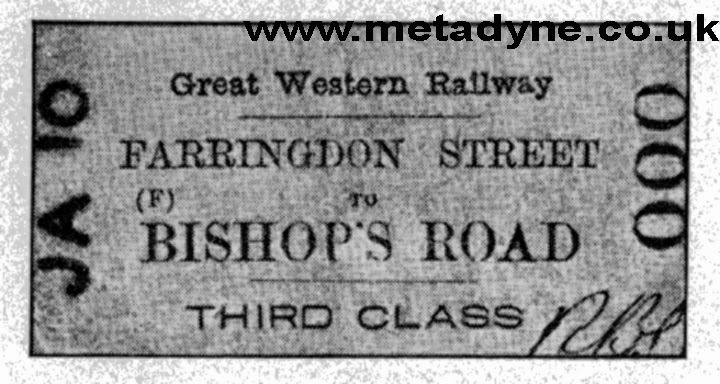 I put in an image (above) of a ticket issued for the first day, and you can see it is headed Great Western Railway. Unfortunately the financial agreement was unsatisfactory in practice and the GWR was slow to provide the additional services the Metropolitan wanted in order to cope with rapidly developing traffic. For this, and other, reasons the companies fell out and the Metropolitan found itself in the position of having to work the line on its own account from August 1963 using carriages borrowed from the London & North Western and Great Northern Railways, and condensing locomotives from the latter. The GWR, incidentally, were happy to allow the Metropolitan to take on many of the staff already used on the line; it didn’t have to do this as there was no ‘TUPE’ in those days, but it suited it to be rid of the staff commitment immediately without the need to transfer them elsewhere in large numbers, or to lay them off, which would have been vexatious as the Metropolitan would have rehired them anyway with much press odium aimed at the GWR into the bargain. As far as I can see, the difficulties were entirely of a commercial nature and the transfer was quite gentlemanly. [I would suggest that all this, and how the transition was managed, is quite poorly recorded in most books and would provide a useful area that needs to be researched by someone: there is plenty new to be said about the early days of the Met]. Of course, as soon as it was obvious the Met would need to run its own services (suspected as early as March 1863) its own carriages were ordered. These were fairly similar to the GWR ones but reduced in width to suit the ‘narrow’ gauge, or standard gauge as we call it today, and with many other detailed alterations probably borne out of experience. The carriages were built by the Ashbury Carriage and Iron Company and it is suggested all 34 entered service by 1st October 1863 (and perhaps all on that day). The carriages were all 39ft 6ins long and built of wood on an angle-iron underframe that was slightly shorter than the body. Each carriage had eight wheels, in two groups of four, but did not have bogies, the 3ft 6ins (approx) wheelsets arranged to have a lot of lateral play in order to negotiate curves. The carriages were equipped with compartments, those for first class being wider than the second/third class ones such that four compartments of the latter occupied the same space as three of the former. Each carriage comprised 6 x 1st, or 8 x 2nd (or 3rd), or 3 x 1st and 4 x 2nd (or 3rd) compartments, and some had the end compartment arranged for the guard, with double doors to facilitate carriage of large luggage. The first class compartments had eight seats and were luxuriously fitted out with plush seats, armrests, curtains and carpets. The others were comparatively basic with only bench seats (nominally seating six aside), with second class having a thin cloth cover but third being bare wood. Only these 34 vehicles entered service in 1863, though more were ordered and delivered between 1864 and 1868, the fleet finally reaching 142 vehicles. All had gas lighting fuelled by coal gas carried in rubber bags in the roof. The early vehicles were soon much modified, including allowing the outer wheels a degree of swivel to reduce the grinding on curves. A composite 1st and 2nd class Metropolitan 8-wheeled carriage. Although this is from a very slightly later batch with radial axles boxes already fitted, it gives a good idea of the Metropolitan’s first vehicles. It is carriage 91, one of a batch of two of that type from 1866. It is a feature of old carriages that being substantially made of wood the scrap value was quite low and was quite usual for them to be sold on for further use (sometimes, without wheels, as holiday homes, sheds, summer houses and so on). Many of the original Metropolitan carriages actually survived for many years and the photograph below shows a number of carriages in Normandy as late as 1960. Why they went there I am unable to say. Original Me carriages somehow still around in 1960. It looks as though they are still on wheels and telegraph wires suggest they may even be on rails. On the same day as the new carriages began operating, 1 October 1863, both the Great Western and Great Northern Railways began running their own trains along the Metropolitan. The GWR began operating trains to Farringdon Street from Windsor (outer destinations varied) while the Great Northern trains came from a number of suburban stations along its main line. It had been intended the GNR trains should begin on 1 September, but their having to lend the intended stock to enable the Metropolitan to run its own services put this back. The GNR used two connecting tunnels at Kings Cross. Northbound trains called at the ‘down’ Metropolitan platform before diverting off along the steep so-called ‘hotel’ curve before emerging into daylight about half way along the main line station; the average gradient was 1:48 and conditions in the tunnel were appalling with grease and condensing water creating a dangerously slippery rail surface that defeated more than one train and for some years a man was employed in the tunnel to put sand down between trains. On one occasion a train in trouble slid back down the incline into the one behind, the crew not noticing it was going backwards (afterwards lights were installed so drivers could tell which way they were going). The link connected with main line tracks immediately outside the tunnel mouth and at first these trains pulled into the tunnel and backed into the main line station to pick up additional passengers before proceeding north (one might have thought they could just have gone to the nearby Metropolitan station and got on there). This pantomime continued until 1 February 1878 when a platform (connected to the new suburban station) was inserted alongside the slope so that trains could call there instead. Starting and stopping along this steep greasy gradient became a fine art. The ‘up’ connection via the so-called York Curve was equally vile, with a vicious curve near the junction with the Metropolitan and a down gradient of 1:46. Trains ran into their own platform at Kings Cross (Metropolitan) with the junction with the Metropolitan tracks at the east end. At main line level it was possible for trains to call at a platform outside the tunnel mouth called York Road, which was not connected with the main station. Some trains at first carried through carriages to Kings Cross GNR that had to be detached here and shunted into the main station, which must have been thunderingly inconvenient. It was during October 1913 that through season ticket rates were introduced across all the various tube railway lines, improving the lot of travellers in London. It is hard to imagine now that when the tubes first opened pretty much everyone had to buy an individual ticket for every journey they made. This slowed down travel, required lots of staff and failed to reward those travelling regularly (enabling them to drift off onto buses or competing railways). I have always maintained that ‘through ticketing’ is one of the hallmarks of a coherent transport network, and that the London Underground was pretty much a network by the end of the First World War. This was an important step. On 6 October 1963, the signal box at Turnham Green was closed and control passed to a new interlocking machine room equipped with three programme machines. The arrangements here were complicated owing to the continued operations of goods trains along the District Line to coal depots at West Kensington and High Street Kensington, trains originating from the London Midland Region via Cricklewood, Acton Wells and the north curve at Acton Lane. Westbound goods trains were not a problem, they simply used the westbound District Line and took the Richmond branch at Turnham Green (the points to the Acton Lane curve were operated by Acton Lane signal box, controlled by the Southern Region). Westbound goods trains were considered a problem as the westbound District from Richmond was quite steeply graded (some at 1:50 up) so the ‘old’, less steeply-graded, route was retained alongside the eastbound District (to Richmond) which acted as an unelectrified goods loop where goods trains could lay over for a convenient slot. Trains then passed underneath the Ealing line and onto the eastbound Piccadilly, through Turnham Green station and into a second goods loop via which they finally got to run on the eastbound District Line. All this required considerable extra complexity, the worse for its short life as these goods trains were withdrawn within a couple of years. The only other significant event during one of these significant Octobers was the opening of the Railway Training Centre at White City, on 20 October 1963, replacing the old training centre at Lambeth North. Lambeth had opened as a training school in 1920, and itself replaced several earlier training schools and other training arrangements originated by the first underground railways. It had occupied the cavernous station at Lambeth North, eventually sharing facilities with a medical centre and clothing store that became possible when the original entrance ticket hall was closed (and moved to what had previously been only the station exit), thus giving the school and its accoutrements occupation of the basement, half the ground floor and most of the first floor areas. Even before World War 2 this accommodation was obviously going to be far too small for the much expanding network and it was agreed that larger facilities would be made available in the new building at Edgware Road, to have been called Lisson House, but actually opening as Griffith House, named after Murray Griffith, a respected Underground Group director and financier, who died on 6 January 1937, presumably engendering the thought that he needed commemorating. The war stopped the move to Griffith House, which soon filled up, as these buildings do. After the war, pressure on Lambeth North was tremendous and limited expansion was only possible by moving peripheral services out. Even so the training equipment was very dated and not always suited to the modern equipment now being introduced. Even by 1950, thoughts were turning to doing something on the spare land at Wood Lane, but it was more than a decade before money became available to erect a purpose-built building (Hammersmith was also looked at in 1960, on a site near where present control room is being finished). The new building (now a ‘centre’ rather than a ‘school’) was on two floors with lecture and demonstration rooms on top floor, a etc etc. Large equipment was situated on the ground floor and included a section of station platform (with standard station equipment provided) and track and a section of tunnel with signals. There was a demonstration area showing means of removing traction current, and a device that produced an electrical arc, a terrifying sight that after seeing the demonstration ensured that nobody would want to see one in real life out on the railway. There was a section of railway carriage (a real one that had been involved in an accident) in order to demonstrate door operation and guard’s controls, and there were various traction and braking systems represented, using real equipment (much rather old and recovered from Lambeth). Particularly memorable was a large model railway with automatic signals and two real signal frames anda push button desk. Rolling stock staff also had a facility there for training maintenance and call staff in rather more detail how equipment worked and had to be maintained. A driver’s cab simulator was later provided, at huge expense, but I never myself saw it ever in use. A small canteen and theatre (doubling as an examination room) were also provided, the latter often used by BBC staff as an overflow for the TV centre opposite, and used for rehearsing (something of a distraction for those who could see in from nearby lecture rooms). The 1963 training centre on site of Wood Lane car sheds (the smaller White City depot lies behind). For most of the Underground’s life, at least during electric days, training has been divided into ‘indoor’ and ‘outdoor’ training. Indoor training concerned understanding the basic rules and regulations and the theory about how the railway and its equipment worked. Outdoor training (much of which of course was actually ‘indoor’) meant on-site instruction by specialists and usually attachment to someone who already did the job one was training for, and who was deemed to have the right temperament and sense of responsibility to train. It became the custom for ‘indoor’ trainers to be suitable ordinary members of the staff with an interest in promotion to a senior grade and who were attached to the training centre for a few years. They were temporarily appointed to a supervisory grade (if not one already) and trained to train, so to speak. For many years they were uniformed as inspectors, which gave them some clout when out and about, but by the time I encountered the school the powers that be had come to regard them as equivalent to station managers, with gold braid. I would think that the majority of instructors probably left the school having proved their worth, often going out as a divisional inspector, later area manager, regarded as the first step in a management career. Some, for one reason or another, either returned to their old job or went out as a trainee line controller or some other specialist job. At about the time of the Kings Cross fire the philosophy changed and ‘professional’ permanent training staff were introduced. Whether loss of service experience was compensated for by ‘better’ training I could not say, but what I can say is that as the Underground shifted from a system with pretty much standard equipment throughout, to one where each line has something different, training had to change and there was greater emphasis on outdoor training than had perhaps previously been the case. This contributed to the ultimate closure of the centre (now under the Westfield shopping development) and re-establishment at Ashfield House, at West Kensington.